Hershey, PA (January 18, 2018) – On Wednesday, January 17, 2018, Howard Hanna Pennsylvania President Tom Ceponis and Central Pennsylvania Regional Manager JoAnne Freidly were joined by the company’s Hershey office agents and other Central region managers at the Hershey Country Club as Wendy Feaser-Ryan was announced as the new Sales Director of the Howard Hanna Hershey office. A native of the Hershey area, Feaser-Ryan has been a licensed Realtor since 1997, specializing in selling and marketing residential real estate with a secondary specialty in farms. She currently resides in Derry Township and has spent her entire life in the region. Real estate and helping people achieve the dream of home ownership have always been her passion, and she is excited to enter this new phase of her career. Feaser-Ryan is a member of the Greater Harrisburg Association of Realtors and the National Association of Realtors. The Howard Hanna office is located at 1249 Cocoa Avenue in Hershey, 17033. Wendy Feaser-Ryan can be reached there at 717-520-0020 or wendyfeaserryan@howardhanna.com. 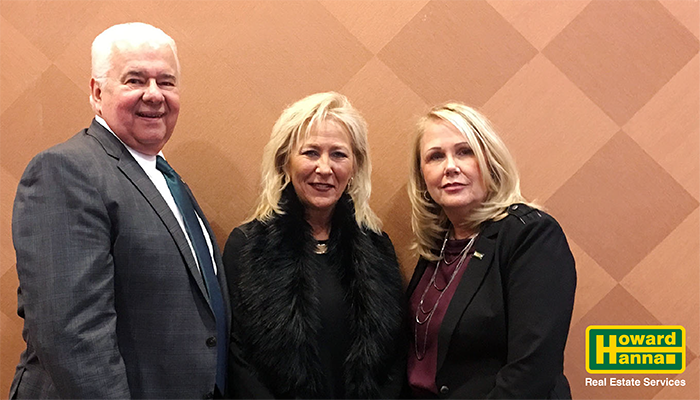 Pictured L to R: Howard Hanna President of PA Tom Ceponis, Wendy Feaser-Ryan, Howard Hanna Central PA Regional Manager JoAnne Freidly.